1.Crystal oscillator should be as close to the IC as possible, and the wiring should be thicker. 2.The shell of crystal oscillator should be grounded. 3.The clock wiring is output through the connector whose pins should be full of grounding pins around the clock pin. 4. Making analog and digital circuits respectively have their own power and ground pathway. If possible, you should try to widen the circuit of both power and ground or using separate layer, reducing the impedance and any interference voltage between power supply and ground loops. 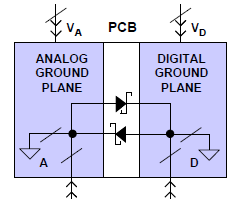 5.The analog ground and digital ground of a separate working PCB can be tandem by a single point near the system ground point. If supply voltage is the same, then power supply of analog and digital circuit can be tandem by a single point. If the supply voltage is inconsistent, a 1 ~ 2nf capacitor can be parallel installed near the power supply for providing return current with path. 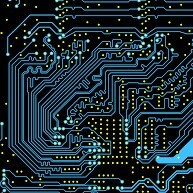 6.If the PCB is inserted on the motherboard, the motherboard's analog and digital circuit power should be separated from ground. Analog and digital ground is near the motherboard, the power supply is tandem in single point near the system point. If supply voltage is the same, then power supply of analog and digital circuit can be tandem by a single point. If the supply voltage is inconsistent, a 1 ~ 2nf capacitor can be parallel installed near the power supply for providing return current with path.